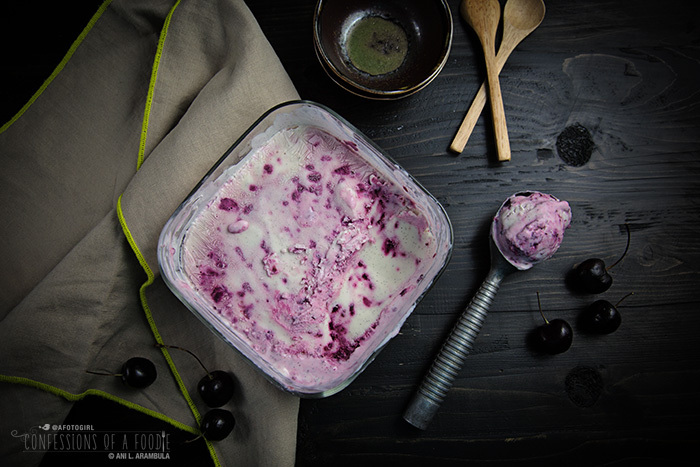 Crisp Cherry Pitter makes this recipe for Roasted Cherry Vanilla Bean Frozen Yogurt a breeze. Try this healthier frozen treat that is lower in fat with less cholesterol and sugar than a traditional custard-based ice cream. Most cooks love kitchen tools that make prep easier. I'm no exception. I recently received a cherry pitter from Crisp, a line of tools created to promote healthy living. When our SoCal weather went from warm to hot, I knew that I wanted to put this new tool to the test with something cold, creamy and sweet. Originally, I thought of ice cream but since I'm trying to be good and get back on track with my diet after two indulgent vacations two months apart, I instead opted for a healthier frozen yogurt. I'm doing things a little differently today: I created this fun recipe video for you so you can see how easy this Crisp Cherry Pitter is to use. Ready to try this recipe? Scroll to the end of this post for written instructions. This recipe makes a little less than a quart, perfect for four people. Use the leftover roasted cherries, in regular yogurt, oatmeal or even pancakes or muffins. 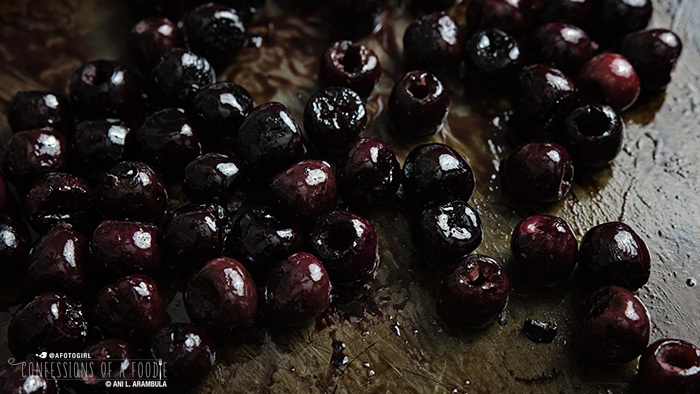 A little bourbon is added to the cherries when processing which helps to keep them from getting rock hard in the freezer since alcohol doesn't freeze. That's also the reason why I called for 2 tablespoons of vanilla extract in addition to the vanilla beans as most extracts are alcohol based (I used my homemade vanilla extract). Use full fat Greek yogurt for a creamier texture or 2% if you must. Nonfat can be used but the texture will greatly suffer. Be sure to freeze your ice cream maker bowl for at least 24 hours for the best results. Optionally, also return the blended yogurt mixer to the refrigerator for 2 hours if there is time before churning. Preheat oven to 400 degrees Fahrenheit. Lightly spray a baking sheet with cooking spray. 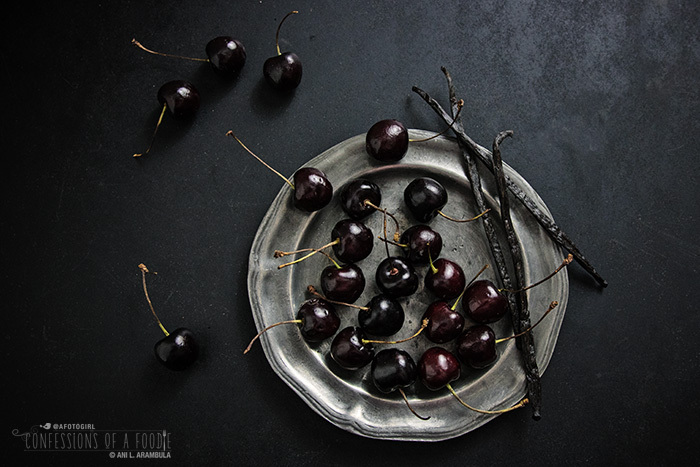 Spread the pitted cherries onto the baking sheet and sprinkle with the erythritol and 1 teaspoon of the lemon juice tossing to coat. Roast for 15 to 20 minutes or to taste, being careful not to burn fruit. Remove from pan immediately. Fill a large bowl with ice water. Place the cherries into a zipper bag, seal and place bag into ice water bath to cool completely. 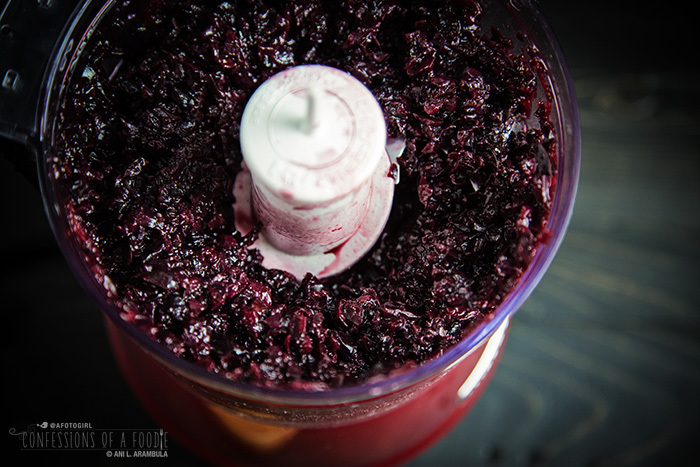 When cool, place cherries in a food processor, adding the reserved lemon juice and the bourbon, pulsing to desired texture. Set aside. 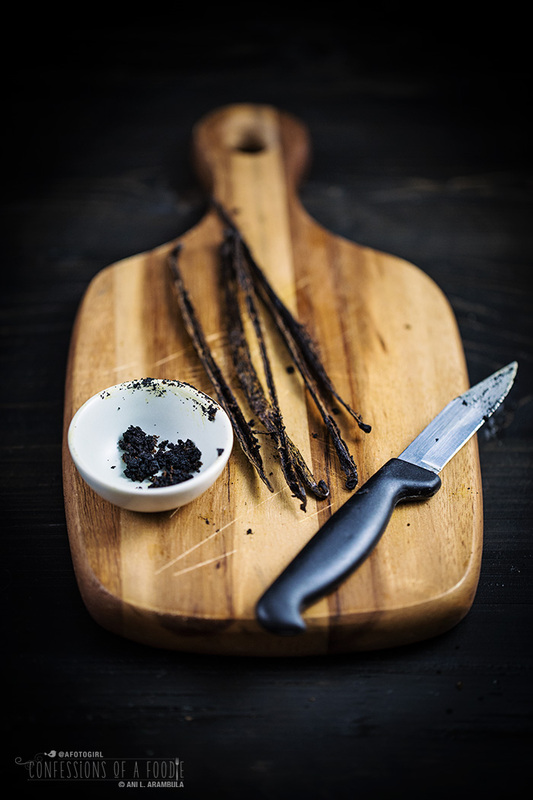 Cut the vanilla bean pods in half length-wise. Working with half at a time, carefully pry the pod open then use the back of a knife to remove the beans and place them in a small prep bowl. Repeat for all pods. Scoop the yogurt into a blender. Pour in the half and half and stevia. Add the vanilla beans and vanilla extract. Blend on high for 2 to 3 minutes or until the mixture is smooth and the vanilla beans are evenly distributed. 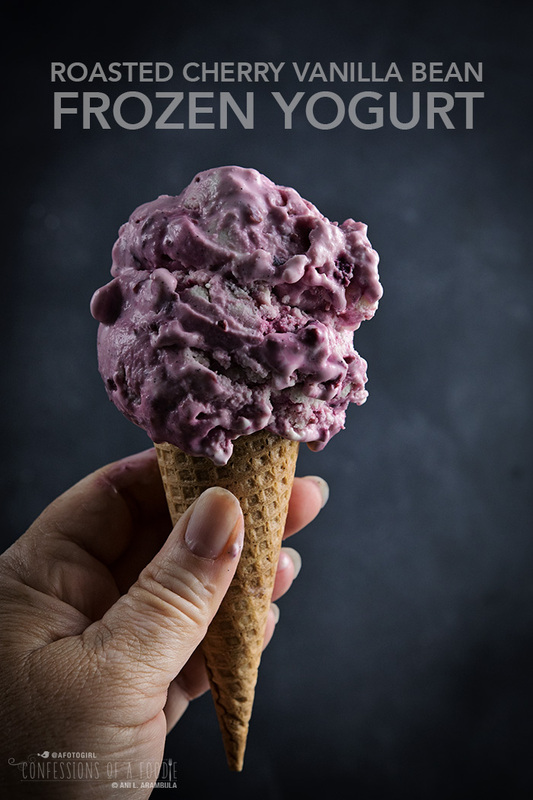 Add the yogurt mixture to your ice cream maker and follow the manufacturer's instructions for the churning process, typically churning for 12 to 20 minutes depending on the brand or until yogurt is firm. Transfer the yogurt to a freezer safe 1 quart container. Add desired amount of dollops of cherries to the yogurt, carefully folding them in. Yogurt can be served immediately or for a firmer texture, cover tightly and place in freezer for 2 hours. If yogurt is too hard, allow to rest on counter for 10 minutes before serving. I received a cherry pitter from Crisp for review and post consideration. No other compensation was received nor was a favorable review guaranteed. All opinions, recipe, and photography are my own. Thank you for supporting the sponsors who help me keep this site going. Want a cherry pitter of your own? Click here. Wow! Love your video and your photos! And you know, Ice Cream! not to mention the bourbon!